Floor plans seem to have confirmed the company’s attendance. While it has yet to be officially confirmed, recently discovered floor plans for the main exhibitor hall of the 2017 Electronic Entertainment Expo (E3) hint at Activision having a larger presence on the showroom floor during this year’s event. 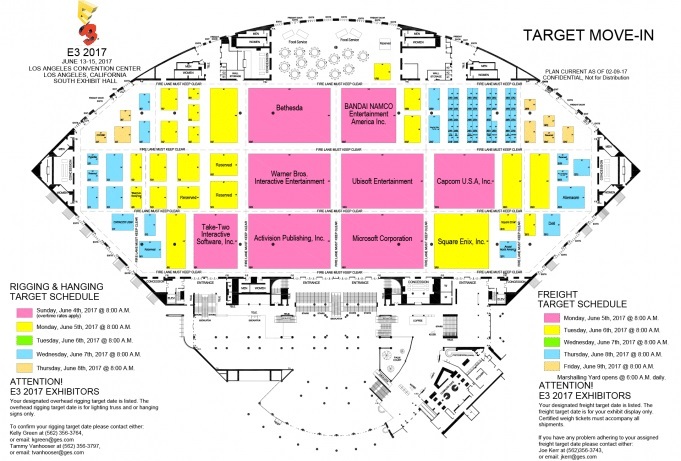 The floor plan was originally shared over on NeoGAF, confirming that some of the hall’s larger booths will be owned by companies like Bethesda, Ubisoft, Bandai Namco, and Activision. Meanwhile, on the official E3 2017 website, Activision is also listed under the “Participating Companies” banner, though this simply means the company’s games will be featured as part of the show. The reason why the presence of an Activision booth during E3 2017 would be a bigger deal than usual is that the company famously chose to skip E3 2016 (the first time it had ever done so in the event’s history). As an alternative, Activision chose to host a separate event alongside Sony where they unveiled the latest entry in the Call of Duty lineup, Infinite Warfare. No matter how big or small Activision’s E3 presence is this year, they’re expected to reveal both this year’s new Sledgehammer Games-produced Call of Duty title as well as the long-rumored Destiny 2 from Bungie during the E3 2017 event period. The NeoGAF floor map also seems to confirm that Warner Bros. will be on deck during this year’s E3 which means it will hopefully divulge new information on the recently unveiled Middle-earth: Shadow of War.